I wandered through two World Wars with Garland last week in a single double feature. In one film Garland shows Gene Kelly the movie-making ropes (for which he is forever after and articulately grateful in print) and in another Garland shows us and the Academy her acting chops (and earns herself an Academy Award nomination). Judgment at Nuremberg presents drama culled from historic court cases prosecuting judges who implemented the race purification and persecution at the root of the legal structure implemented during (and dismantled after) the Nazi regime in Germany. For Me and My Gal provides yet another in the string of Garland films that in part honored the vaudeville tradition from which she emerged and was quickly fading into nostalgic memory in the age of talking pictures and other community diversions. For Me and My Gal also provides a patriotically themed World War One “rally the citizenry” kind of film for America in the early days of yet another World War. Busby Berkeley troop-movement dance routines plus some of the most exquisite young Garland romantic moments on-screen, all in the context of another movie-version of war-time, through the gauze of nostalgia. Twenty years later, drama amid the aftermath of concentration camp atrocities and star turn acting moments by some of Hollywood’s best. Twenty years apart, these movies provide career signposts for Garland. 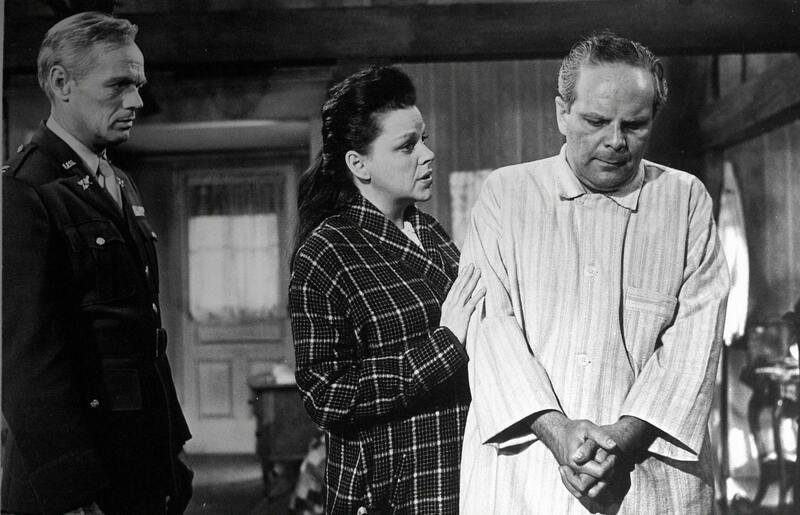 Colonel Lawson (Widmark) convinces Irene Hoffman Wallner (Garland) and husband Hugo (Howard Caine) that “it would come to this”. Playwright and screenwriter Abby Mann examines the Nuremberg trials that occur after the well-known trials in which Nazi masterminds are brought to justice after the end of the Second World War. After the generals and the master plan developers are brought before the tribunals amid much international media scrutiny, the focus of the trials becomes the institutional players who implemented the rules. While these trials are not as scrutinized by the public and by the media, Mann’s brilliant dramatic point is that without judges to hold trials based on the Nuremberg Laws (who could own property, who could associate with whom, which acts of everyday living were deemed illegal), the laws could not have been applied in the first place. Within the dramatic construct of these trials we also examine the lives of the Germans who live under the laws, who revel in their existence, or who merely think, as did the married cook and butler assigned to American lead Judge Haywood that “Hitler did some good things”. The cast is riddled with excellence, and young actors coming into their own. Spencer Tracy is Judge Haywood the “rock-ribbed Republican” from Maine who has agreed to lead the triad of judges hearing the judges’ cases. Burt Lancaster is Ernst Janning, a brilliant jurist and legal scholar who feels he doesn’t belong among the Party faithful who join him as defendants, yet he joined them in implementing the Nuremberg laws and, in particular, was judge in the case of a young girl Irene Hoffman who was charged and convicted with consorting with a Jewish man. Marlene Dietrich is Madame Bertholt, our German daughter of the military, whose husband was convicted in a prior trial and executed, whose beautiful home Judge Haywood occupies during the trial, who represents a historical military tradition that has to deal with the era of military service under the Nazi. And then there is Irene Hoffman as a middle-aged woman played by Judy Garland just prior to her historical Carnegie Hall performance in April 1961. Pared to her non-singing acting essence, we have Garland in three scenes: when American prosecutor Colonel Lawson comes to solicit her testimony on this painful experience of many years before, and two courtroom scenes. It has been said that when Garland’s emotional second courtroom scene was shown in rushes to the assembled cast, they burst into spontaneous and unanimous applause. One feels that same instinct at many moments in this magnificent and important movie. Jo Hayden and Harry Palmer melting your heart. Vaudevillians attempt to make it into the big time in the early part of the 20th century and meet cute in a small town in the American Midwest — Garland is Jo Hayden, already part of a cheesy but moderately successful act on an established traveling bill, and Gene Kelly is Harry Palmer, doing a solo bit with schlock-y clowning. He has ambitions and their voices blend so sweetly (“For Me and My Gal” indeed), and this stalwart sister of a soldier falls for the heel. Colleagues warn her of his self-centered ambitions, but she ignores them, and Jo and Harry hone their act, attempting to make their way to the vaudevillian’s mother lode: The Palace in New York City. Where Judgment at Nuremberg analyzes the decisions of individuals and institutions (and individuals driving institutions) after the fact of wartime, For Me and My Gal examines individual instincts (yes, through a hazy, gauzy patriotic lens) at the moment of national need. Harry’s first instinct is to attempt to get out of or delay his entry into the draft to achieve his goal of playing the Palace — and other characters react differently. Of course, patriotic fervor and courage wins out — this is 1942 after all and America is in the midst of another world-wide conflagration. This movie has achingly lovely moments aplenty — for my money the reason to revel is the mastery of the hotel room scene between Jo and Harry when she thinks he is going away to join another performer, beginning in suitcase packing and ending in sobs then tender kisses and professions of love on the hotel bed — well. That scene seals it, Garland appreciation wise. 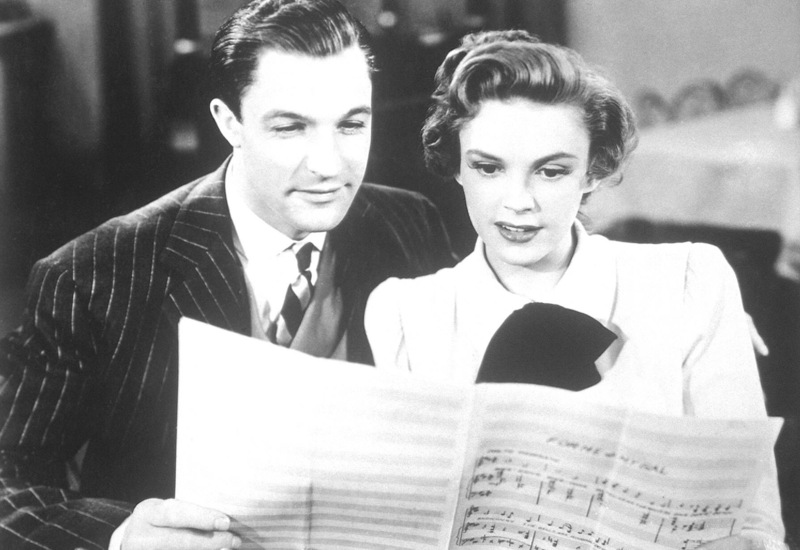 And to gild the lily, this movie provides several songs that Garland performs for the rest of her life including “For Me and My Gal” and “After You’ve Gone”. War is the vehicle for drama. The art is in the acting. Oh my. Harry Palmer and Jo Hayden study up. For Me and My Gal.